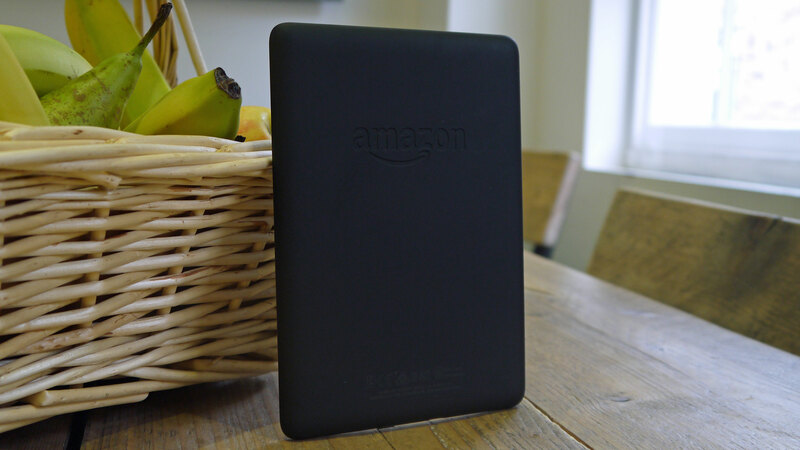 Amazon claims the battery on its latest Kindle Paperwhite is set to last for weeks, and we found that to be correct. We’ve used the Kindle Paperwhite for roughly an hour a day for the last week and it dropped around 30% of its battery over that time. That means it should last for around three weeks depending on how much you use it. If you're going to be reading more, the battery will drop quicker. But even if you're reading for a few hours a day with the brightness high, you should find it will last at least a week before needing a recharge. Different levels of brightness will see the battery survive for different amounts of time, but the Kindle Paperwhite doesn’t take long to charge up with a micro USB cable plugged in to the bottom of the ereader. This won’t offer the six week battery life you can get from the Kindle Oasis (2017), but it’s good enough for you to be able to throw it in your bag and find it just works when you need to pull it out again for a quick read on your commute. 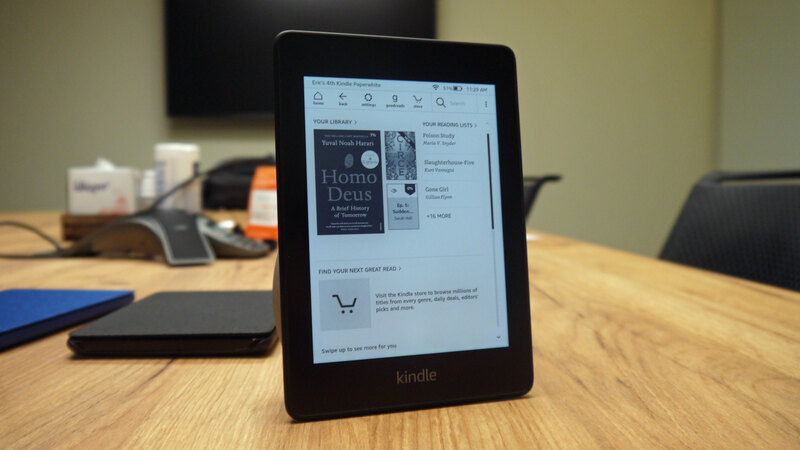 As we’ve said in the screen section, this is a particularly comfortable reading experience and the Amazon software makes for an easy to use device. Another feature taken from the Oasis and packed into the Paperwhite is audiobooks integration, enabling you to listen to your Audible titles on the ereader using Bluetooth headphones or a Bluetooth speaker. 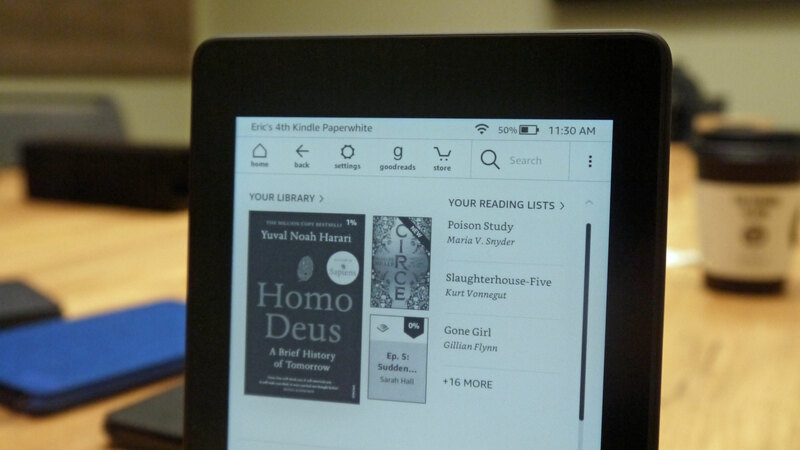 You can upload them all to your Kindle Paperwhite, and then connect to your device easily to listen to your books while you're on the move. You can also seamlessly switch between the ebook and audiobook version of a title in the software if you have both versions. This can get expensive as the audiobook titles can sometimes cost quite a lot, but it's useful if you're trying to make your way through a particularly long book. To be able to fit audiobooks in, there's now either 8GB or 32GB of storage inside the Kindle Paperwhite depending on what model you go for. 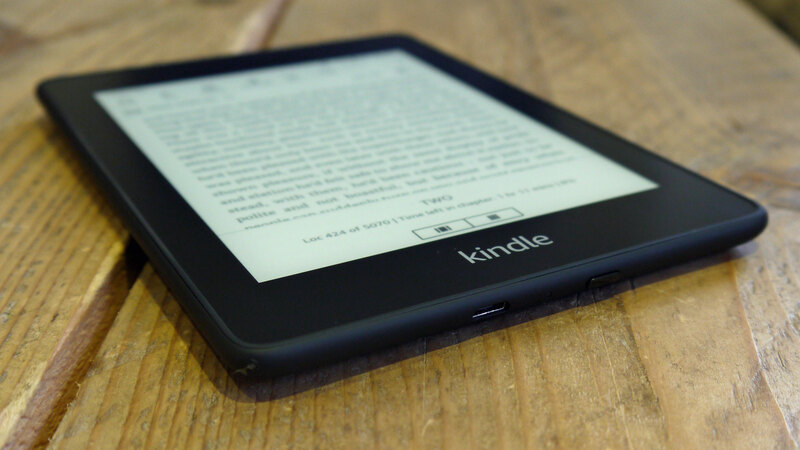 8GB is double the storage of the last Kindle Paperwhite, and while it may not matter if you're just reading ebooks this is important if you want to include audiobooks on your ereader. If you don't want to have audiobooks, we'd recommend opting for the 8GB version, as it will still offer lots of space for thousands of ebooks, as they're relatively small files. 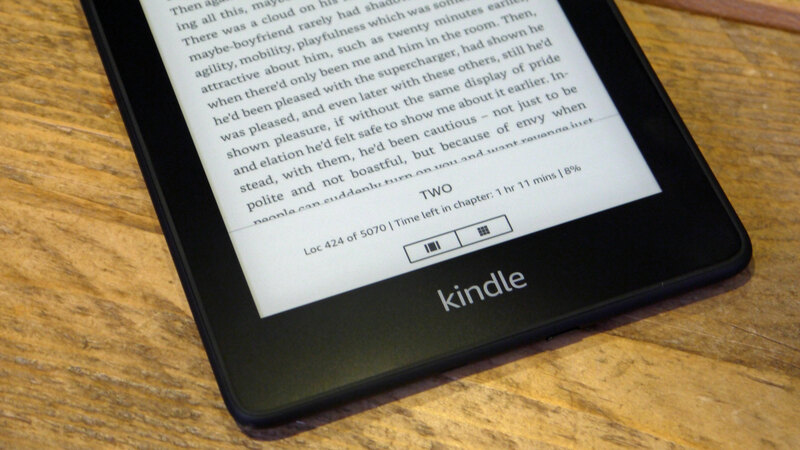 The new Paperwhite comes with the latest Kindle software, so you've got all the existing features as well as access to Amazon's store of literally millions of ebooks and hundreds of thousands of audiobooks. 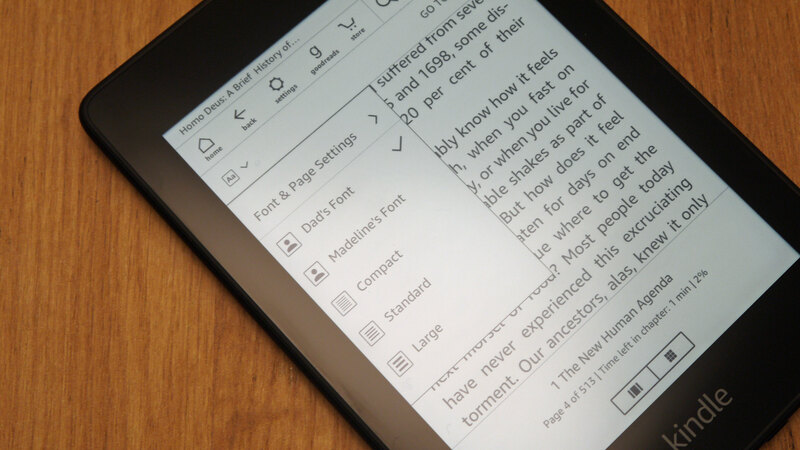 The software will be familiar if you've used a Kindle before, but there are a few tweaks and some new features, our favorite of which allows you to set font preferences so multiple people can use the same device. Say someone in your family prefers to read at a larger font, while someone else prefers to have a smaller font and lots on the page. With this new feature you can now set up profiles for individuals. A particularly good example of a use for this is when reading with children, as it means you can quickly swap between fonts even when you're in the middle of a chapter. With a simple tap on the top right, you'll see a drop-down of all your profiles so you can easily switch between these. Otherwise, it's similar software here to what we've seen on previous Kindles. One missing feature here is the Dark Mode that's available on the Kindle Oasis, which allows you to invert the colors so you'll read white text on a black background. That makes it particularly easy to read in the dark without eye strain, and it's something Amazon hasn't seen fit to include here. We hope it's something the company will consider in the future. Other than that, we have few complaints about the software. Brightness is easy to control with a few taps, and we found it easy to switch up the settings. The new Kindle Paperwhite is a big step up compared to the last edition of the ereader we saw the company launch back in 2015. Technology has moved fast in lots of industries, and while the ereader hasn't fundamentally changed in that time it's good to see most of the improvements come to the Paperwhite. In fact, there's now only one real reason to buy the more expensive Kindle Oasis (2017). That's the design, and if you want a premium-feel product you'll want to opt for the Oasis instead. But that is almost double the price of the Paperwhite, so if you're happy with the mid-range look and feel of this ereader it will be much more suited to you. The average book reader who doesn't want to spend lots of money on a new ereader is the exact market for this. If you want an ereader to use on your commute or you just want a comfortable way to read books, the new Kindle Paperwhite is perfect. There are some important upgrades here, and our favorites are the fact it's waterproof, making it even more durable than before, and the fact you can upload audiobooks. 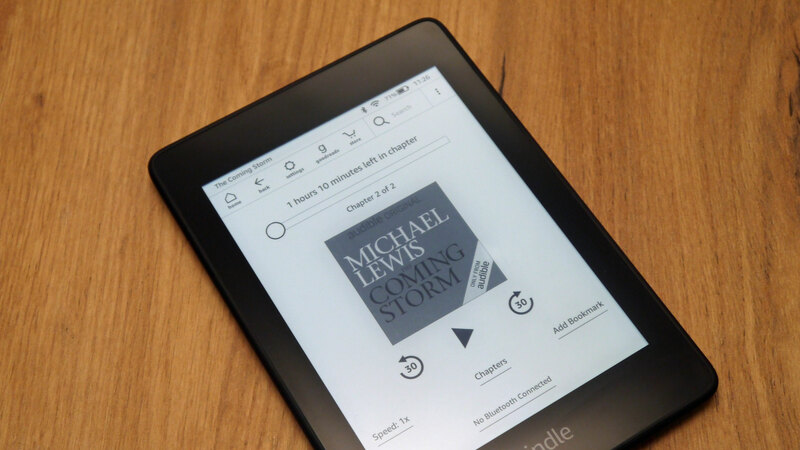 If you already own the last generation Kindle Paperwhite, it's unlikely you'll want to upgrade to this as the normal reading experience hasn't fundamentally changed. It's just everything else the Paperwhite offers that's now better. Own an older ereader? You’ll likely want to upgrade to the new Kindle Paperwhite for its extra features, great reading experience and the ability to put audiobooks onto your ereader. Everything about the Kindle Paperwhite is that touch better than the normal cheaper Kindle model and while it’s not as premium as the Kindle Oasis it isn’t far off. You’ll want to buy the Kindle Paperwhite if you’re after a great reading experience and you’re not too worried about having a top-end design.